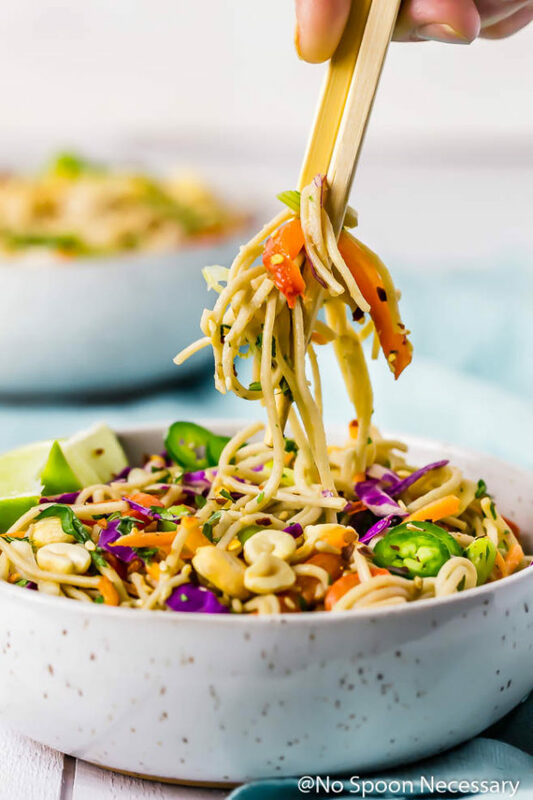 Refreshing and light yet seriously satisfying, these Thai Tahini Veggie Soba Noodle Bowls are slurp-tastically delicious. Ready in 30 minutes or less, these quick and easy bowls are perfect for lunch or dinner! This post was originally published in April 2016. 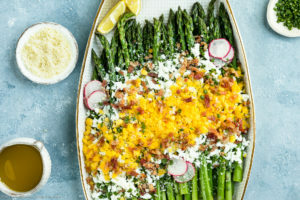 I made edits to the photos and changed some of the written post below to include more information about the recipe. So I have a random question for you guys today. What the heck did we do before google? Where did we turn to for the answers to all of our trivial, arbitrary life’s questions? I guess I already know the answer to this since I specifically remember asking Jeevs, and before that gathering large quantities of books at the library to seek out the answers to just one question or topic. But really, looking back… what the heck did we do before google? Answer: We spent hours of our time getting answers to serious questions. We didn’t waste time getting the answers to questions that didn’t need an immediate answer. (<– At least I didn’t). Think of how much more knowledge we have, now that answers to all (well almost all) life’s questions are at our finger tips. For example, Saturday night Boy and I were outside with our Fur daughter and he said, “Hazel, come look at this red star in the sky.” I looked and immediately googled, “red star in the sky” on my phone. Turns out it wasn’t a star at all. It was Mars. We, of course, proceeded to talk about how amazing it was that we were staring at Mars, and I couldn’t help but think, I would have never known what we were looking at if it wasn’t for google. I mean, I most definitely wouldn’t have gotten in my car and drove to the library at 10 o’clock PM. So, I guess I just want to thank all the people who made the internet possible. Thank you for giving me access to a wealth of knowledge, and somewhere to turn when I need the answer to some nonsense that I have running through my brain. Anyways, I know all that was completely random. But I couldn’t help myself from rambling this morning. To reward you for dealing with my baloney I made you guys some kick arse noodle bowls. Cold soba noodle bowls just scream spring and summer to me. They are refreshing and cool, light yet satisfying and 100% slurp-tastically delicious. Plus, they are a ‘choose your own adventure’ type of meal, which I love. You can customize them to what you are craving, or simply empty out your fridge of all the veggies that are about to expire. Oh, and on top of all that fabulosity, these bowls take less than 30 minutes to whip together, from start to finish. For this salad I chose to go with an Asian spin, for both the vegetables and the dressing. 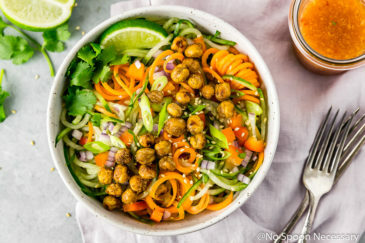 These bowls of yum are slightly spicy, a smidgen sweet, herbaceous, and packed with crunchy, healthy vegetables. 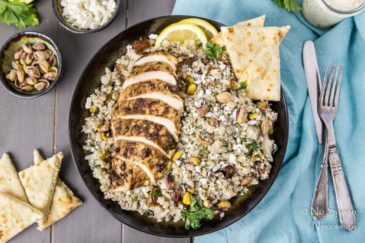 The ginger-tahini dressing finishes this dish off with the perfect amount of creamy, silky, smooth deliciousness. Ultimately, this noodle salad is off the charts scrumptious. Annnnd they happen to taste just as good the next day, so I highly recommend you made extra and nosh on these leftovers for lunch. But, before you go off and print this recipe, I have a few notes for you. What are soba noodles? What are soba noodles made of? Soba noodles are Japanese noodles made from buckwheat flour. They became popular in Japan during the late 1800s and they have a strong, nutty flavor. Dried soba noodles look very similar to flat spaghetti, except they are usually light beige to grayish-dark brown in color. Since soba noodles are made from buckwheat, they are naturally gluten-free, plus they are cholesterol-free and a good source of protein and fiber. Buckwheat, or soba noodles can be found in the ethnic isle of most major grocery stores. What is tahini and what does tahini taste like? Tahini is simply a paste made of pureed sesame seeds and it has a texture similar to peanut butter or almond butter. 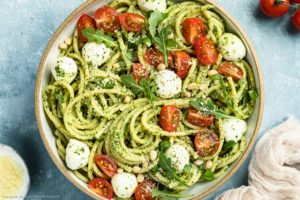 Most people know tahini as a distinctive common ingredient used in Middle Eastern dishes such as hummus or baba ghanoush, however tahini is a versatile ingredient with tons of potential (think dressings or as a sauce for these easy soba noodles!). Unlike most nut butters, tahini does not have that characteristically sweet flavor. Tahini has a delicate roasted sesame flavor and is slightly bitter in taste. Where to buy tahini and how to store tahini? You can find tahini in the ethnic or condiment aisle of most major grocery stores. Tahini is a wonderful pantry staple, because it simply needs to be stored in a cool, dry place, like a cabinet or on a shelf of your pantry. Since tahini will separate as it settles, always make sure you give it a few really good stirs before using! 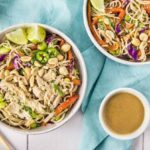 These Thai Tahini Veggie Soba Noodle Bowls can be made vegetarian or you can add a meat protein. I have made them both ways, and trust me, both are delicious. Rotisserie chicken is delectable in here, simply shred it and add it in. Boom – winner winner chicken soba noodle dinner. For extremely fast prep time: buy pre-shredded carrots, jarred roasted red peppers and shelled edamame. You can either purchase a bag of pre-shredded cabbage or use a food processor to shred the cabbage quickly. When dressing the noodles, start with 4 tablespoons of the dressing and toss to combine. Add in more dressing, 1 tablespoon at time, until desired balance of dressing to noodles is achieved. 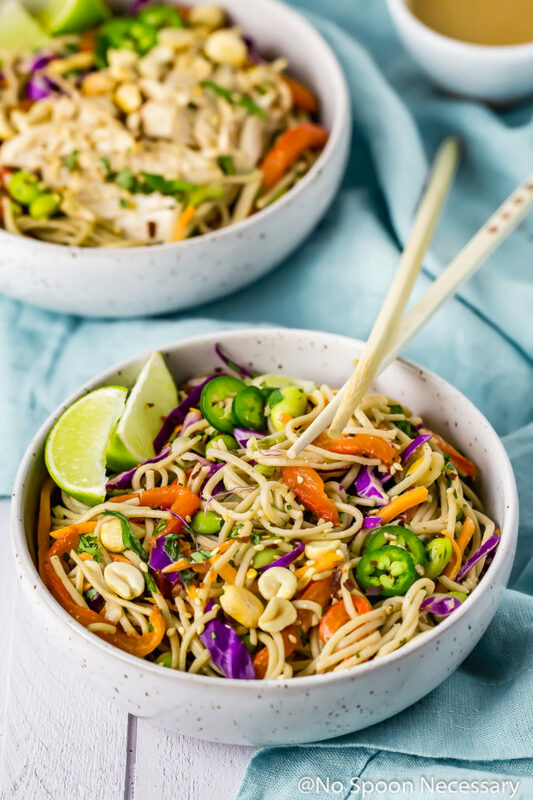 Perfect for an easy lunch or dinner, I know you guys are going to love these sooo(ba) delicious Thai Tahini Veggie Soba Noodle Bowls! Until Thursday, friends – Cheers to easy meals that don’t sacrifice your time or flavor. 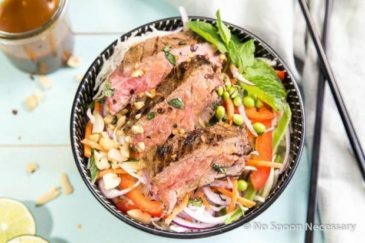 Refreshing and cool, light yet satisfying these Thai Veggie Soba Noodle Salad Bowls are slurp-tastically delicious. Ready in 30 minutes or less these quick and easy bowls are perfect for lunch or dinner! Prepare soba noodles according to package directions. When finished, transfer noodles to an ice bath to stop cooking. Drain well and set aside. Prepare the Dressing: Add all ingredients to the bowl of a food processor. Pulse until smooth and combined. Taste and adjust for seasoning. For the Salad: In a large bowl mix together all the salad ingredients except for the peanuts and sesame seeds. Add in the cooked and drained soba noodles. Mix to combine. Add in 4 tablespoons of the dressing and toss to combine. For heavier dressed noodles, add in more dressing, 1 tablespoon at a time, tossing to combine. 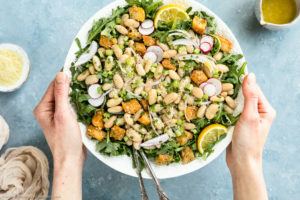 To Serve: Divide salad between serving plates and garnish with peanuts and sesame seeds. Optional - Top with rotisserie chicken and serve with lime wedges. Serve extra dressing on the side. *Salad can be prepared a day in advanced. Toss with dressing until ready to serve. *Dressing will keep, covered in the refrigerator for up to 5 days. *Roasted red bell pepper is optional, can substitute raw red pepper. 1. Heat oven to high broil and arrange oven rack to top position. 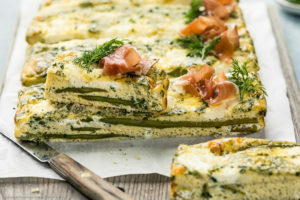 Place pepper on a baking sheet lined with aluminum foil. 2. Broil, turning every 2-3 minutes, until charred on all sides, about 8-10 minutes total. *Nutritional information includes everything except optional chicken. Technology is a double edged sword in my opinion Chey. I love it and hate it at the same time sometimes! Now, these bowls? Total love! Love the sweet and spicy combo. 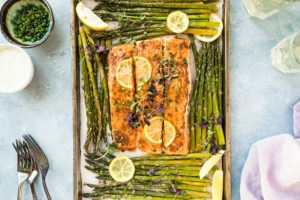 Perfect for summer for lunch or dinner. The dressing sounds absolutely tasty! Every time I google something I ask myself what I would have done 15 years ago when I needed that information. Technology, while irritating at times, is so amazing! I have vague memories of learning to use a card catalog and thinking it was all very confusing so I’m glad the internet came about before I went to college :). 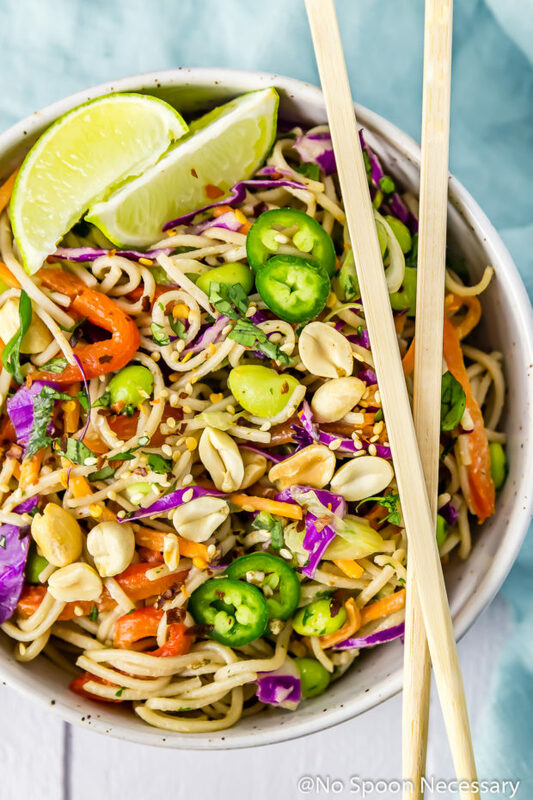 As for these noodle bowls, I freaking LOVE tahini so I need to make these ASAP! Aren’t we lucky to live in the now? I mean, Google and the other uber cool programs like Photoshop, apps and things we take for granted now… I mean I can look up lyrics to a song and not sing it wrong anymore! Speaking of, have you seen the app Star Walk> Just hold it up to the sky and it tells you EVERYTHING, galaxies, planets, stars, even orbiting satellites! As for this bowl of noodles and fresh goodies, it’s a visual meal and I bet it tastes just as good as it looks. Slurp-tastic, love it! I seriously have NO clue what we did before Google. I feel like we would call our closest Trivial Pursuit and Jeopardy-loving friends and hope they had the answer, LOL! These bowls look soooo yummy! Love all the rainbow colors in there! Seriously, Google solves everything! I can’t think of how many times I stand in the grocery story and look something up on google. 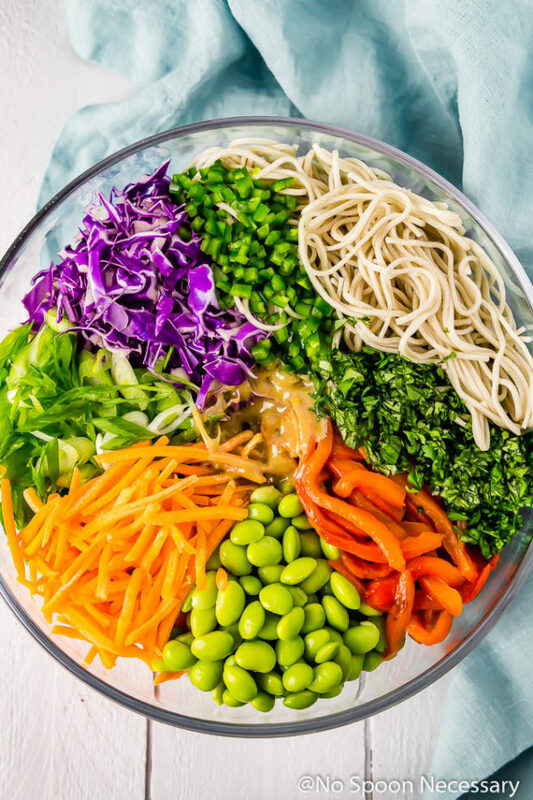 I want these beautiful, fresh and colorful veggie soba noodle bowls for lunch. 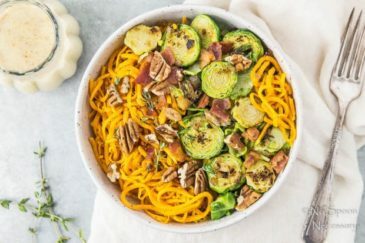 I love how many fresh ingredients you packed into these bowls! Haha I have no idea what we did before Google and think I rely on it way too much sometimes 😉 Love these gorgeous bowls! Soba noodles are one of my favorites especially when they are loaded with so many goodies! The Internet has pros and cons (but mainly pros!) especially when it gives me the ability to see this gorgeous bowl 😉 can’t wait to recreate it at home! Gosh – it’s amazing how easy it is to access info now. No more lugging around heavy library books (dewey decimal system!) – you’re now just a click away from whatever you want (good or bad). But the best part of the internet is connecting with like minded people – like other bloggers, Cheyanne! 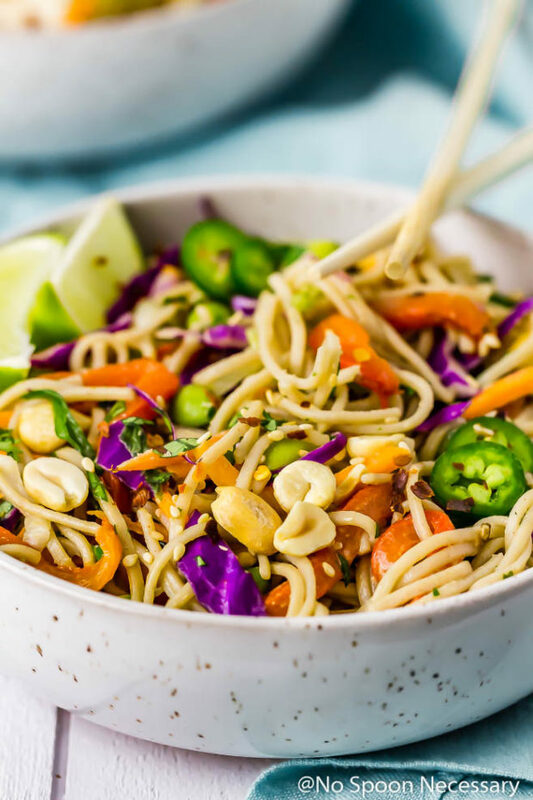 So thanks to the internet I get to see what you’re cooking up each week – like this awesome noodle bowl! I’m always on the hunt for healthier lunch choices, and this recipe is calling to me. I love noodles and rice dishes! This one looks mouthwatering good, Cheyanne! 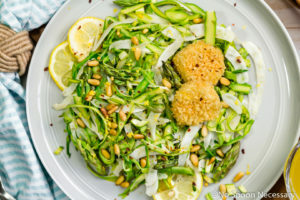 I could eat this dish all day I love quick and easy noodle dishes.Your photos are just gorgeous and I wish I had a big bowl of these right now! YUMMY! The internet is so great! I also love being able to google things or get directions right from my phone when I am out and about somewhere! Life is so much easier! This noodle bowls look amazing. I love all of those great goodies you have in there! This is exactly what I’d like for lunch today, Cheyanne. It looks so good!! !